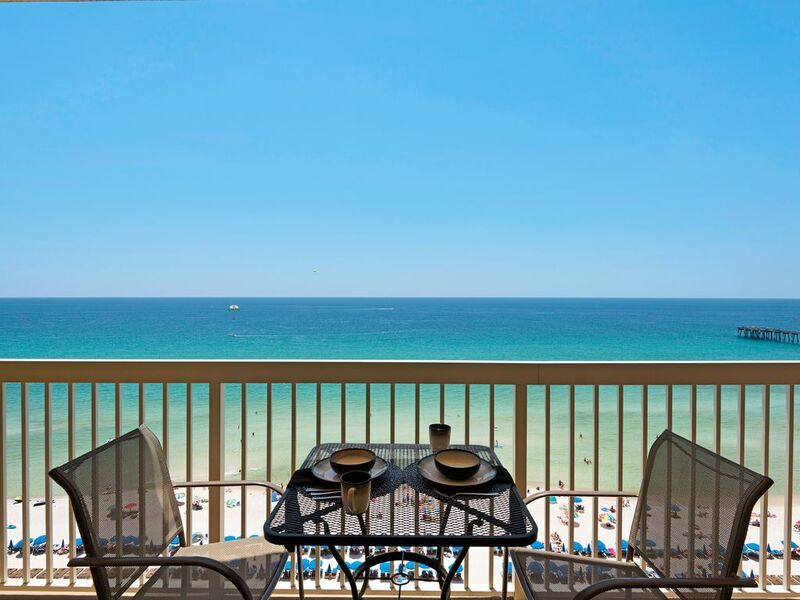 Calypso Resort and Towers bring to Panama City Beach a new class of luxury, comfort, and excitement. The twenty-two story Caribbean inspired towers are designed for the ultimate in beachfront living. Our condo is on the 12th floor, on the West end of the East tower, offering breathtaking sunsets from the wrap-around balconies; a photographer's delight! You may also want to take a look at our other Calypso Condo VRBO listing # 678242. ALCOHOL ON THE BEACH? Some have the misconception that alcoholic beverages are no longer allowed on the beaches at PCB. This law only applies during spring break, March of each year. The rest of the year alcoholic beverages are allowed on the beach. Beach chair service with 2 chairs and umbrellas. We also provide 4 beach towels and a beach cooler. Both bedrooms have king beds. There is also a queen sleeper sofa. Well equipped kitchen including crock pot. Well equipped bathrooms, one walk in shower and one bath/shower, with hair dyers and linen. Location, location, location! The proximity to Per Park and the ability to walk to dinner and eat at a different restaurant is one of the great amenities. Also shopping from Walmart to Target to Marshalls to Dillards. Not to mention the list of awesome boutiques, As Seen on TV, a no-sweat Turvis tumbler in all shapes, styles, colors, team logos, etc. and so much more at Pier Park and Pier Park North. Fully equipped fitness center on property. Large living room with balcony access and ocean view. Smooth top with 4-burners - electric stove. Self cleaning oven, included with stove. Large dinning room table with 6 chairs. Also 2 bar stools. DVD player in living room and mastersuite. Several books available for your reading pleasure. Balcony access from LR and Master Suite. Wrapped balcony with great view of ocean, sunsets and Pier Park. Scotty's Boat Rentals - Hwy 98 toward Panama City. On right after you cross Hathaway Bridge. 3 great golf courses near by. 2 large pools for guests only.